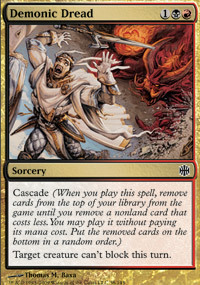 card text: Cascade (When you play this spell, remove cards from the top of your library from the game until you remove a nonland card that costs less. You may play it without paying its mana cost. Put the removed cards on the bottom in a random order.) Target creature can't block this turn.